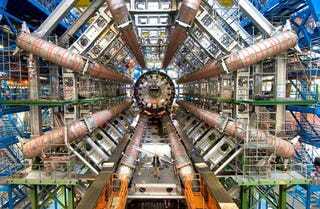 Police has arrested a 32-yo physicist at CERN's Large Hadron Collider, linking him to an Al Qaeda terrorist group. Just fraking great. As if we didn't have enough with the morons predicting Apocalypse and the thing failing on its own. According to French newspaper Le Figaro, judicial sources point that the man—who has been working as a particle physics contractor since 2003—has links to Al Qaeda groups in the Islamic Maghreb. Le Figaro said that he had suggested terrorist targets in French soil. There's word if the target list also included the LHC, however. None of our research has potential for military application, and all our results are published openly in the public domain. Indeed. Let CERN work alone in peace and fix the LHC while the rest of us don't do our homework.